Rev. 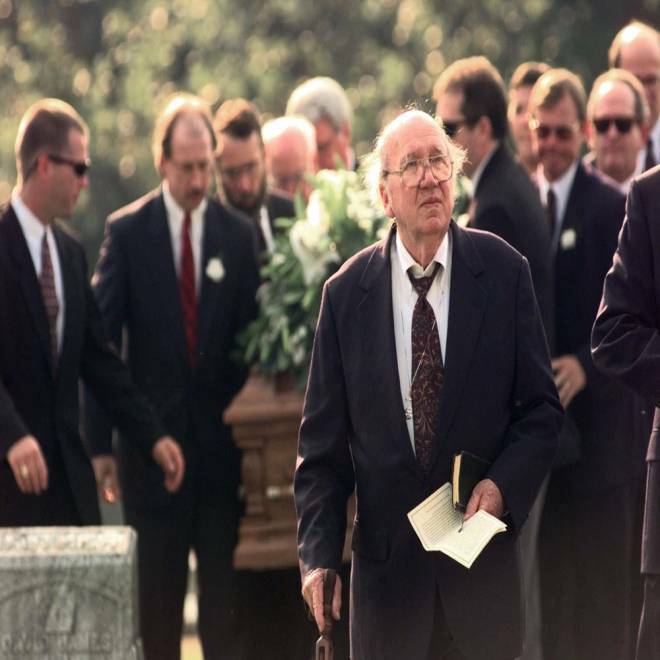 Will D. Campbell leads the pall bearers carrying the body of writer Willie Morris at a cemetery in Yazoo City, Miss., Aug. 5, 1999. Will D. Campbell, a towering figure of the U.S. civil rights movement who was the only white person present at the meeting that led to the creation of the Rev. Martin Luther King Jr.'s Southern Christian Leadership Conference, has died at 88, his family said Tuesday. Campbell's death Monday night was announced in an email message sent on the family's behalf to Campbell's friends and acquaintances by the noted author and journalist John Egerton, a lifelong friend. Campbell died in Nashville,Tenn., of lingering complications from a stroke he suffered in May 2011, Egerton said. "His condition had been declining gradually for the past month, and turned suddenly critical over the weekend," Egerton said. "... For him and for his family, his departure was not a cry of despair; it was more like a whispered sigh of relief. Finally, he is at peace." An ornery, profane minister and author, Campbell was a larger-than-life figure who broke with his own Baptist Church to champion civil rights beginning in the 1950s. His colorful speeches and writings angered many white Southerners, but he eventually ended up ministering to Ku Klux Klan members because, he said, they deserved God's mercy, too. Among his many books was a memoir, "Brother to a Dragonfly," a finalist for the 1977 National Book Award, which Time magazine named one of the 10 most notable works of nonfiction of the 1970s. "Will Campbell was a sage," Rep. John Lewis, D-Ga., one of King's partners in the civil rights struggle, said Tuesday night on Twitter. "He was a gift to America who never received the recognition he truly deserved. He will be deeply missed." Campbell moved from pastorate to pastorate across the South during the 1950s before finally settling at the Committee of Southern Churchmen, of which he was director for many years. At every stop, he agitated for equal rights for African-Americans, burning bridges and building them, too. He was one of the four people who escorted the black students who integrated the Little Rock, Ark., public schools in 1957. He was the only white minister among about 60 pastors invited to attend the meeting in Atlanta that same year where King laid the foundations for the SCLC. He joined the Freedom Riders who worked to integrate buses in Alabama in 1961. He was with King for the march on Birmingham in 1963. He was King for the march on Selma, Ala., in 1965. "Will, in addition to all the wonderful things he did, was among the few people who understood the problem of the church, not as 'they weren't good enough' or 'they wouldn't work hard enough,' but just because they would not accept the renegade spirit of 'no' that Will brought to the church." Campbell was also for a while a pop culture icon. "Kudzu," a comic strip written by the Pulitzer Prize-winning cartoonist Doug Marlette, prominently featured an outrageous but good-hearted country pastor named Rev. Will B. Dunn, who Marlette made it clear was based on Campbell. President Bill Clinton awarded Campbell the National Humanities Medal in 2000. He is survived by his wife of 67 years, Brenda Fisher, a son, Webb, and two daughters, Bonnie and Penny.